The visible one minute Tourbillon is integrated into the Aventurine dial. Opaque or translucent, containing crystals that were engendered by fire in molten glass, Aventurine scintillates, subtly flecked with all possible shades of red, yellow and grey. Forged by human hands, often compared to the philosopher’s stone, Aventurine contains the secrets of the master jeweller’s alchemy. This last edition limited Ulysse-Nardin Genghis Khan minute repeater in platinum features a 42mm case, Aventurine dial, and a crocodile strap with deployment buckle. The Ulysse Nardin Genghis Khan minute repeater watch also features a manually wound tourbillon movement with a Westminster chime carillon minute repeater and animated battle scene figures. This is the last limited edition 30 piece series. The previous two were in rose and white gold. The Genghis Khan will be produced over the next 6-8 years in a limited edition of 30 pieces each in white and pink gold 18 ct.
At the time of Ulysse Nardin’s revival in 1983, it didn’t only set out to perpetuate it’s many great mechanical achievements, but also to restore the art of enameling, which involves the meticulous process of filling delicate patterns outlined by gold wire with vitreous enamels which are then repeatedly kiln fired layer by layer to achieve the proper consistency and color. It is this rare art that decorates the Ulysse Nardin San Marco collection with famous naval scenes, ships, or renowned historical architecture. The Ulysse Nardin San Marco lady is available in yellow gold or white gold. In 1995 Ulysse Nardin patented the Big Date dual window display, adjustable both forward and backwards, which is now in use in the beautiful tonneau shape of the Ulysse Nardin Michelangelo. 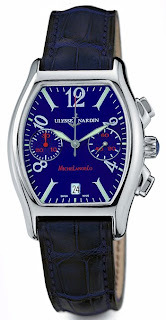 There are several other complications available, including a dual time with dual pushers (like the GMT+-), a chronograph, and a uniquely designed perpetual calendar, the Ulysse Nardin Michelangelo Perpetual Ludovico. 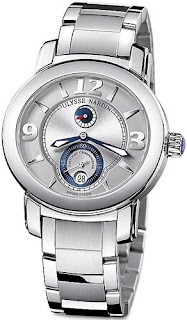 Ulysse Nardin also offers the Michelangelo in a Lady and Midsize version, utilizing the smooth lines of the tonneau shape to create a very elegant and feminine watch. The Ulysse Nardin Michelangelo lady watch is also available tastefully decorated in pave diamond patterns. Ulysse Nardin celebrates their history with the Marine collection by producing a whole line of marine chronometers, which gave fame to the company on their early days and are still very priced by enthusiasts and collectors. There is a varied selection of movements, from a perpetual calendar mechanism, power reserve indicator, the chronograph, or the annual calendar with chronograph, and of materials, like stainless steel, pink gold or white gold, all of them notable for their water resistance, accuracy on timekeeping, and fine hand finished surfaces. Ulysse Nardin Lady Marine watches are also available in pink gold and stainless steel, with and without diamonds. With the Macho Palladium Ulysse Nardin introduces a material previously used only in jewelry to the Haute Orlogerie world. Palladium is a material, discovered in 1803, similar to Platinum but slightly whiter, much lighter and about 12% stronger. 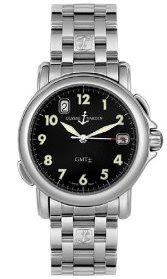 The movement on this watch also has a distinguishable feature which was first used on a Ulysse Nardin pocket watch in 1912: both the hand on the power reserve indicator and underlying disk move. When the movement is wound the disk rotates counter-clockwise until the largest segment of the scale reaches the power reserve hand. When the watch is not being worn, the power reserve hand rotates counter-clockwise until it reaches the smallest segment of the scale. 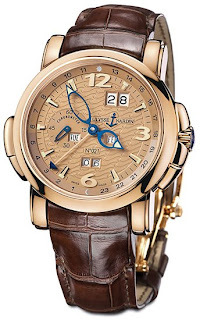 Ulysse Nardin created with this watch a perfect companion for the traveling bussinesman. 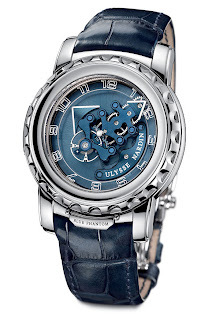 The master watchmakers at Ulysse Nardin have incorporated into this watch a unique patented design which allows for the hour hand to be adjusted forwards or backwards with the use of two pushbuttons, independent of the minutes or seconds hand. A window display indicates the home time, for easy reading. Ulysse Nardin also offers the GMT+- Big Date in a lady size, with mother of pearl dials in several pastel shades, as well as the added elegance of diamonds. Ever since it’s birth, Ulysse Nardin has been at the forefront of outstanding developments in horological technique and from the hand of Ludwig Oechslin, Ulysse Nardin has created the most complicated watch in history, the Astrolabium, as well as a whole array of models which cover the extent of horological experience, such as minute repeaters with automatons, tourbillons, as well as the first perpetual calendar in history with bi-directional adjustment of all calendar displays.This collection also features the Freak, a dual escapement beauty with no hands. Ulysse Nardin, born in 1823 in Le Locle, Switzerland, was an acomplished watchmaker having first been trained under his father, Leonard-Frederic Nardin and later perfected his skills with two master watchmakers, Frederic William Dubois and Louis JeanRichard-dit-Bressel.Ulysse Nardin, the company, was founded in 1846 and remained under Ulysse’s control until his passing in 1876, when his 21-year old son, Paul-David Nardin took over. Since the founding of the company, Ulysse Nardin was known for their high-quality and high-accuracy craftsmanship, so much so that they became known worldwide for their Marine Chronometers, the most accurate mechanical clocks ever made, achieving a precision of around a tenth of a second per day. Until 1967, one second was defined by the rotation of the earth, and because of this, competitive chronometer watches were calibrated and certified in an astronomical observatory. The Observatoire Cantonal de Neuchâtel was the main Swiss observatory where such certifications were done, and in 1975, when the accuracy of mechanical timepieces became irrelevant with the advent of quartz watches, it released a publication regarding the performance of chronometers from 1846 to 1975: of the 4504 certificates awarded in this period, 4324 went to Ulysse Nardin. 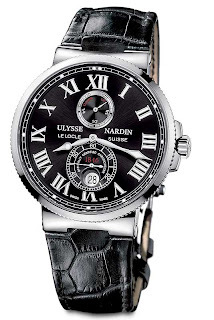 In 1983 Ulysse Nardin was purchased by a group headed by Rolf W. Schnyder, its current president. Mr. Schnyder brought in Dr. Ludwig Oechslin, a scientist, inventor, historian and watch-maker extraordinaire with whom they set out to design and develop complicated timepieces that had never before existed. The first example of this was the Astrolabium, introduced in 1985, part of the Trilogy of Time along with the Planetarium Copernicus (1988) and the Tellurium Johannes Kepler (1992). 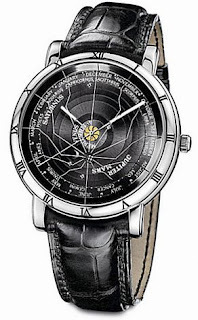 The Ulysse Nardin Astrolabium, entered into the Guinness Book of Records in 1989 as the most complicated wristwatch ever made with 21 complications, indicates the position of the sun, the moon and the stars in the sky at any given hour as seen from Earth, as well as sunrise and sunset, dawn and dusk, moonphases, moonrise and moonset, eclipses of sun and moon, the month and the day of the week. The Ulysse Nardin Ulysse 1 watches, technically and aesthetically beautiful, honor the horological pioneer whose name is by now, a legend. They feature the same amazing power reserve indication as the Macho Palladium: both the hand and the underlying disk move. It comes in pink gold and in a limited edition in platinum.